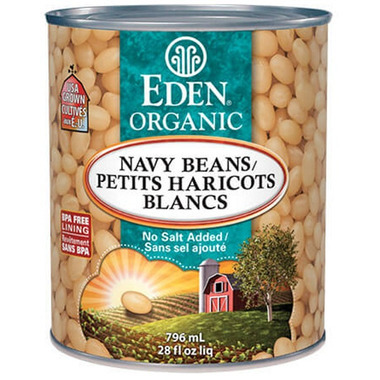 Organic U.S.A. family farm navy beans soaked overnight and thoroughly cooked at Eden's certified organic and kosher cannery with purified water and zero chemical additives. A small white bean aka 'pearl haricot.' It's the baked beans classic and is used in Senate Soup. Rich in healthy fiber and a good source of protein, iron, and magnesium. No salt added.